A sense of déjà vu washed over Greyville Racecourse on Saturday 4 July as for the second year running the capacity crowd and millions of television viewers the world over waited on the edge of their seats for the final outcome of the Vodacom Durban July however in the end first across the line Power King claimed victory from Punta Arenas. Yet again Africa’s Greatest Horseracing Event lived up to expectation as race seven’s drama added to the glitz and the glamour of the morning’s array of fashion competitions, entertainment and on-track action and paved the way for a long night of celebrations and enjoyment for many. Stuart Randolph ridden and Dean Kannemeyer trained Power King was locked in a neck-and-neck tussle with fellow son of Silvano and Maine Chance Farms bred gelding Punta Arenas over the final few hundred meters before contact between the two and an objection delayed the announcement of the final standings for ten agonizing minutes. In the end the judges believed nothing was untoward and the results stood, sending some punters into elation while others were left wondering what could have been, the rest soaked up the final few rays of the gentle winter sun after a day of clear and warm conditions. While the field was abuzz with punters and socialites, hundreds of fashionistas sporting outfits inspired by the cruise couture fashion theme, ‘The Captain’s Table’, had their eyes set on claiming a victory of their own as the day’s various race day competitions afforded them an opportunity to clinch a moment in the limelight. In the end designers Mthonzi Mthembu, Kireshen Chetty, Teez M Fashion House and Sifiso Sabele claimed victory in the Gold Circle Most Striking Couple, Exceptional Raceday Hat or Fascinator and Classic Racewear for Male and Female categories respectively. 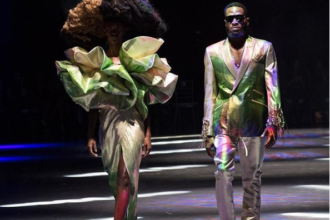 The Vodacom Durban July Fashion Experience didn’t stop there though with the winners of the Vodacom Durban July Young Designer and Fashion Challenge presented by Durban Fashion Fair handpicked by a panel of fashion experts and announced on the ultimate fashion stage. The massive crowd also had the opportunity to soak in all the glam of the eight Invited Designer’s collections made up of Terrence Bray, Haroun Hansrot, Brenda Quinn, Sibu Msimang, Colleen Eitzen, Jane Wolff and Dale McCarthy from McCarthy & Wolff from Durban and Hangwani Nengovhela and Craig Jacobs from Johannesburg, their splendid outfits modeled on the action stage to a crowd of adoring onlookers.